Leeds-based developer St James Securities has completed a forward funding deal with National Farmers Union Mutual (NFUM) for the redevelopment of the former Norton College site in Sheffield. 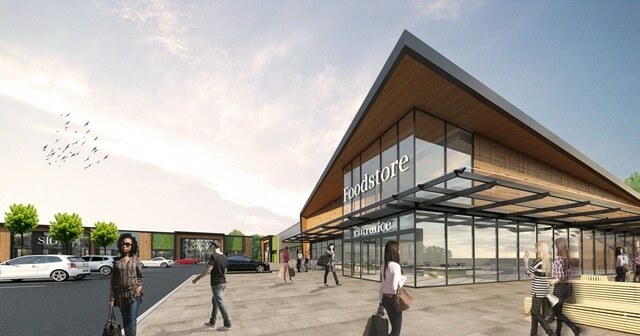 The 100,000 sq ft St James Retail Park, designed by the Chesterfield office of architects’ practice Whittam Cox, is due for completion in spring 2018 and will be home to a number of big name retailers including Marks & Spencer, Next, Aldi, TK Maxx, Wilko, Pets at Home, Mountain Warehouse, Shoe Zone and Costa Coffee. Paul Morris, development director of St James Securities, said: “Completing the funding agreement with the NFUM is great news for Sheffield which will allow us to now deliver this exciting retail scheme. David Watson of WSB Property Consultants advised St James Securities, while Robert Mortimer of Chapman Petrie advised NFUM on the deal. “This is an excellent opportunity for both parties given the gap in the occupational market and the chance to invest in a densely populated residential area with good transport links which will drive retail demand,” said David Watson. Walker Morris advised St James Securities and Gowlings in London represented NFUM.